Whisper Foam is a sound absorbing water resistant acoustic foam designed to reduce reflection and absorb reverberation and airborne noise. Because it is water resistant, it is ideal for external use when fixed to walls and fences. Lightweight – easy to cut and handle. Fire rated to Din 4102 (Class B2). Whisper Foam is designed to be a lighter and easier sound absorber to control reflected airborne noise by reducing the sound bouncing back from hard surfaces and so reduce the overall noise level in any area suffering from reverberated noise. 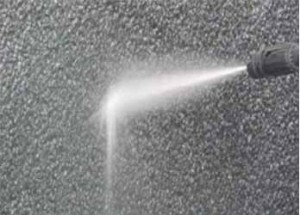 Being water resistant it is ideal for external applications and as can be seen from the photo above, can even be power washed. Applications for this acoustic foam can be many such as an internal lining of enclosures around machinery that uses a lot of liquid, plant machinery, motor vehicles such as boat engine compartments or heavy goods vehicles. The absorption element of this foam is provided Light weight by design, its closed cell structure makes it water resistant without the application of a secondary skin. With excellent acoustic performance the product has been tested to fire safety standard Din 4102 (Class B2). Please note Whisper Foam is not fireproof but does meet Din 4102 (Class B2). 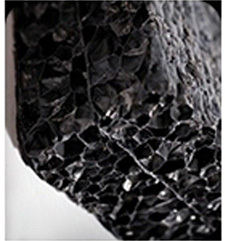 If a non-flammable version of acoustic foam is required, use our FR class 0 type foam.